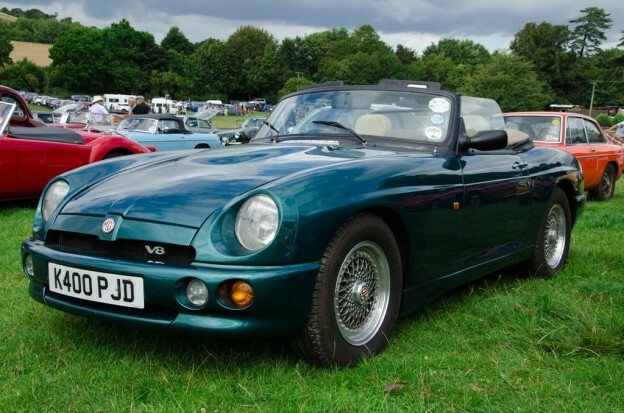 In 1979, The MG Car Company celebrated the 50th Anniversary of its move from Edmund Road, Cowley in Oxford to Abingdon. They asked Morland & Co to brew a special commemorative beer for the occasion. 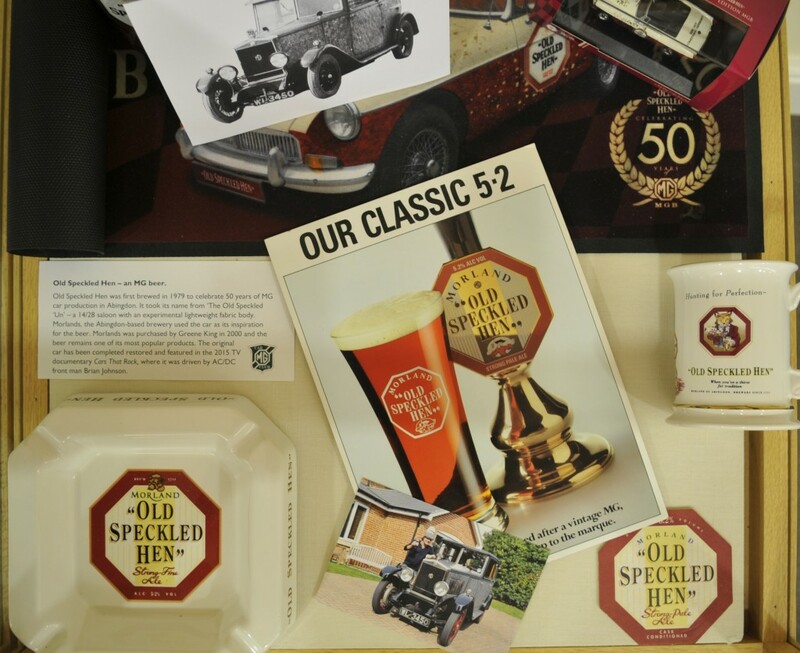 The name chosen was “Old Speckled Hen”, which took its name from a strange car brought to Abingdon when the factory moved. The vehicle, originally built as an experimental car in 1927, was called the “MG Featherlight Saloon” made from cellulosed fabric stretched over a wooden frame, and was black speckled with gold. It became the factory’s general runabout, and as it chugged around the factory, people would say in their Berkshire tones “There gus the owd specleld un….”. 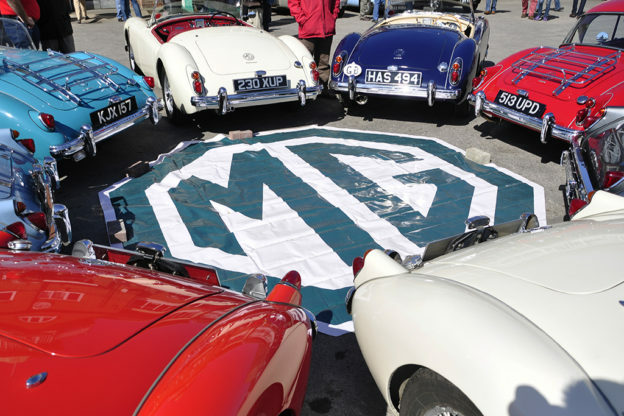 The MG Company held a competition amongst its employees for the design of a suitable label, and the winning entry bore the MG marque linked by a length of chain to the Borough of Abingdon Coat of Arms and was printed in the MG colours of Cream and Brown. The bottle dressing was finished with a green foil capsule to match the background colour of the Borough Arms. The beer, an amber coloured Pale Ale, was brewed at a gravity of 1050 to denote the 50th anniversary. 25 barrels, 1200 dozen half-pints bottles, were produced, mostly for the promotional activities at MG, but also for limited distribution to Morland houses in the Abingdon area. What had been produced as a one-off celebration brew, proved so popular that a second batch had to be brewed in time for the main celebrations which were to be held in Abingdon over the weekend of the actual anniversary. 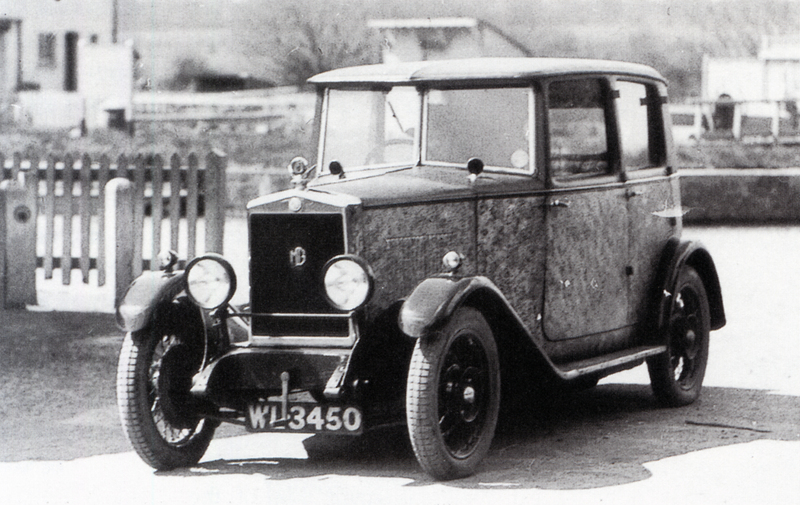 The 1927 MG Featherlight Saloon affectionately known as the ‘Old Speckled un’. 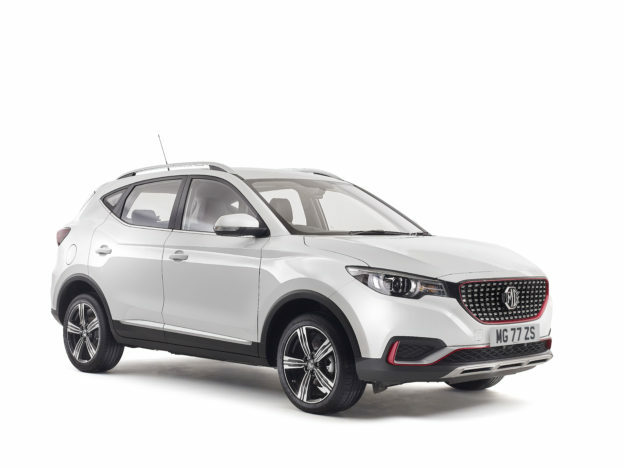 After a most spectacular and greatly enjoyed weekend of festivities, on the following Monday the news was broken to the staff of MG that the factory was to be closed. 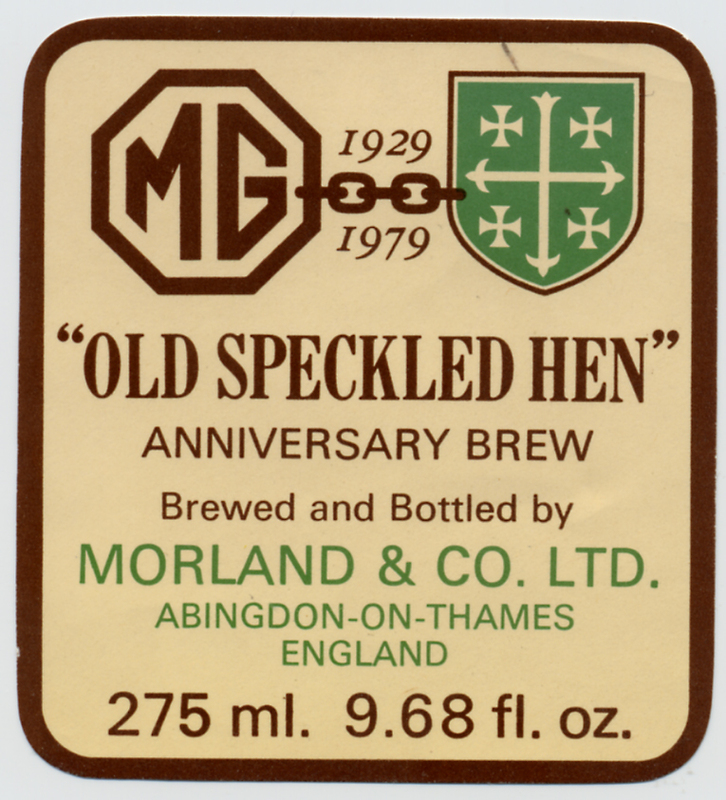 The plant ceased production early in 1980 and the factory was demolished.However, the Old Speckled Hen continued to enjoy local support and was sold throughout the Morland estate in the same bottled form for the next ten years. In 1990, in order to fill a gap in the product range, it was decided to test market Old Speckled Hen in draught form, since high gravity cask conditioned beers were very much in demand. The results from this exercise were extremely positive, and further tests were carried out over an extended area. Draught Old Speckled Hen was launched into the tied trade in the spring of 1990 and became an immediate success. The bottled variety was also repackaged and a canned version introduced. The demand for the beer became so great that additional brew house capacity was required, with the result that the decision was taken to with-draw from lager production in order to make more capacity available for brewing Old Speckled Hen. Eventually, by 1994, the brew house was operating at maximum capacity, and plans were drawn up for a new brew house to be built adjoining the old 1911 tower brew house. This new plant was officially opened in June 1996. A LIMITED reprint of the book ‘MG RV8 – The RV8 Manufacturing Story’ will be available from early November in time for the Christmas present season. With a run of only 50 books the books will be on offer from Wednesday 5th November 2014. 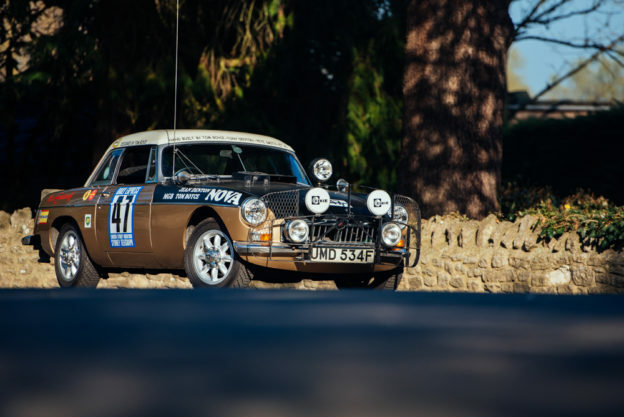 AC/DC frontman Brian Johnson spent the day at Kimber House whilst filming for an MG themed episode of his hugely popular ‘Cars That Rock’ television show. 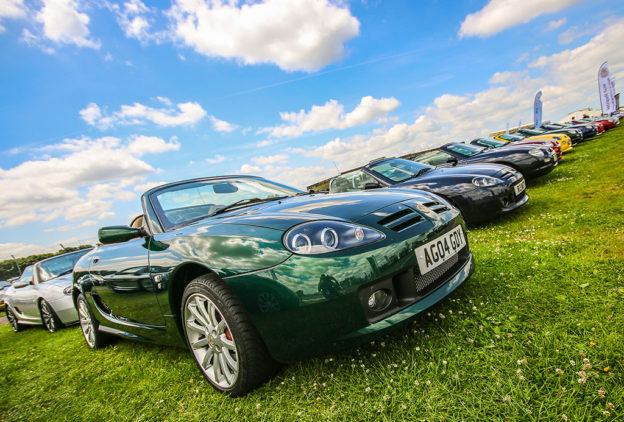 WE ARE very excited to announce an MG legend, the original “Owd Speck’ld ‘Un” will be joining us at Silverstone and taking pride of place in the 90 year timeline!